esupplementsllc has no other items for sale. Sales tax may apply when shipping to: AL(8.0%), AZ(5.6%), AR*(8.57%), CA(8.26%), CO*(6.47%), GA*(7.33%), HI*(4.24%), IL*(1.0%), IN*(7.0%), IA*, KS*(8.05%), KY*(6.0%), LA(4.45%), ME(5.5%), MA*(6.25%), MN*, MS*(7.02%), MO*(7.28%), NE*(5.86%), NV(7.78%), NJ*(6.625%), NC*(6.9%), ND*(5.51%), OH*(6.5%), OK(7.86%), PA(6.0%), RI*(7.0%), SC*(7.36%), SD*(5.6%), TN*(9.25%), UT(3.0%), VA(5.3%), WA*, WI*(5.46%). Prompt shipment & delivery from a New Ebay Seller that does it right ! Item exactly as described. Sent quickly. Well packaged. Came quickly. Satisfactory outcome of purchase. Good customer service. I really can't tell any difference with my nerve pain. MISLABELED!!! It is NOT 600mg. Labeling stresses SERVING SIZE of 2: it is 300mg. Seems to add to Health regimen ! Easy to take. ( Pill Size ) a fair price for total contents of Bottle. Might consider a re-order again. always looking for product Discounts when ordering products. My doctor recommended I try this product in the hopes of helping neuropathy pain from a case of Shingles nine years ago. I haven't been on it very long but so far there has been no lessening of the pain. That is the only reason for my not recommending it. I will continue to take it as my doctor said it might take a few months to see any results. It seems to be of good quality and I would order this again if it helps in the future. I have just started taking this supplement at the direction of my doctor. It appears to be of good quality (I won't really know for some time) and the capsules don't stick to each other (important to me). 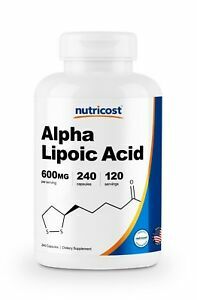 I have read research studies about the possible beneficial effects of Alpha Lipoic Acid on the brain -- "may alter the behavior of certain immune cells, preventing them from entering the central nervous system. This could stop the immune cells from attacking and damaging myelin." So, I'm taking it for my MS. Since "episodes" of degradation of the brain are infrequent for me, I may never know if the Alpha Lipoic Acid has effected the immune system of my brain. A new and probably expensive drug will eventually reach the market based on studies of this acid that may do the same thing, perhaps in a more concentrated form. Switched to try this from another brand because it contained more capsules for the price of any other. Fantastic product, I'm happy that I gave it a try! Will purchase again, thanks a bunch! !